The only known 1943 Lincoln Cent mistakenly struck on a bronze planchet at the Denver Mint has been sold for a record price of $1.7 million by Legend Numismatics of Lincroft, New Jersey. The unique coin, not publicly known to exist until 1979, is graded PCGS MS64BN. The new owner is a Southwestern United States business executive who wants to remain anonymous. He also purchased in the same transaction through Legend a 1944 Philadelphia Mint cent struck on a zinc planchet, graded PCGS MS64, for $250,000, and an experimental 1942 Philadelphia cent mostly composed of tin for $50,000. The unnamed new owner plans to exhibit these coins and others at the Florida United Numismatists convention in January. “The 1943-D bronze cent is the most valuable cent in the world, and it took four years of aggressive negotiations with the coin’s owner until he agreed to sell it,” said Laura Sperber, President of Legend Numismatics. The anonymous collector who formerly owned the coin “donated it to a charitable organization so they could sell it with all of the proceeds going to the charity,” according to Andy Skrabalak of Angel Dee’s Coins and Collectibles in Woodbridge, Virginia who acted as agent on behalf of the former owner. “As a specialist in small cents, this transaction is the ultimate accomplishment for me and I’m privileged to be part of it. I don’t think it will ever be duplicated in my lifetime,” said Skrabalak. Zinc-coated steel was used for producing cents in 1943 to conserve copper for other uses during World War II, but a small number of coins were mistakenly struck on bronze planchets left over from 1942. 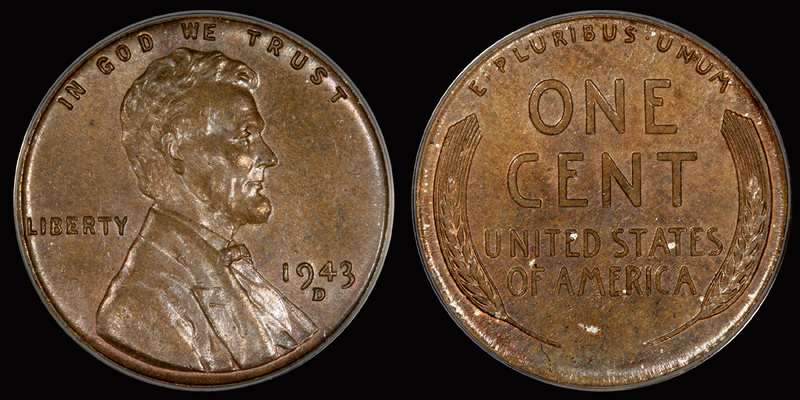 “We estimate that less than 20 Lincoln cents were erroneously struck in bronze at the Philadelphia and San Francisco Mints in 1943, but this is the only known example from the Denver Mint,” said Don Willis, President of Professional Coin Grading Service. For additional information, contact Legend Numismatics at (800) 743-2646 or visit online at www.LegendCoin.com. i have one of these pennies, how can i get a hold of the collector? I would recommend getting your coin authenticated by one of the major grading services, PCGS or NGC, since counterfeits and pieces created for novelty purposes do exist. Then you can probably contact the collector through Legend Numismatics. I have four bronze coins dated 1955,1953,1958,1961,also a two headed nickel dated 1976. my bronze coins are from canada. they are penny’s. Can you help me to sell them?